Program Coordinator for Tshopo Province. Dino’s father was not particularly interested in the forest or conservation. He was a nurse and Dino was one of his nine children, born in 1965 in the village of Pimbo, in the far northeast of DRCongo in what is now the Ituri Province. There was no protected area nearby and no one else in the family became interested in nature. 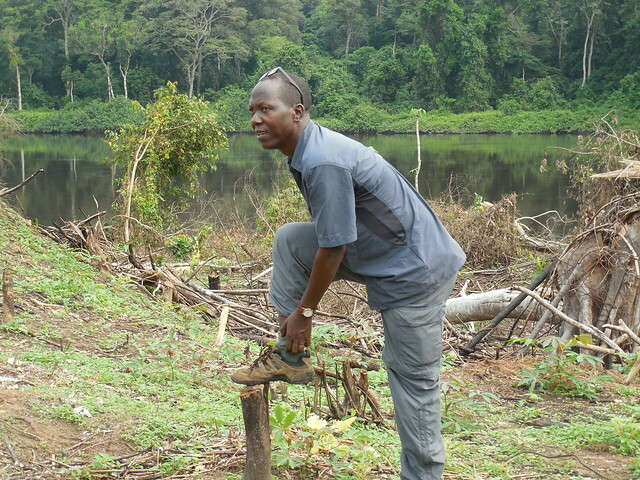 Dino at the new village site, Bangaliwa or Obenge2, coordinating construction. In 1992 Dino visited Epulu in the Ituri Forest and was fascinated by the Okapis and conservation. His first job had been as a secondary school teacher and then, with a background in cultivated plants from an agro-technical institute he attended after high school, he became a consultant for British-American Tobacco. But in 1994, with advice from a friend who worked on botanical surveys in the Okapi Reserve, he contacted Terese. He worked in botanical teams for four years and, when that work was over, switched to faunal teams working with John for an inventory of the large mammals of the Okapi Reserve. He has stayed with conservation ever since. 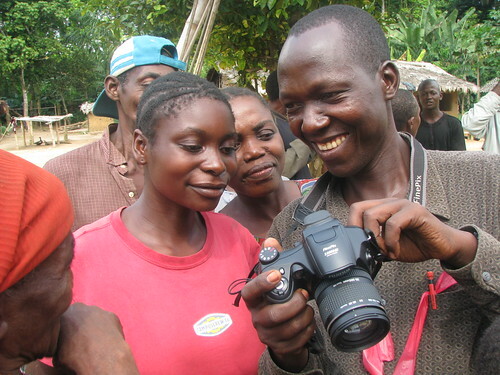 Dino shows some of his pictures in the village of Tubundubundu. 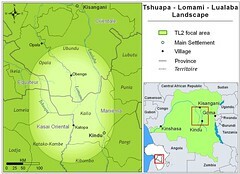 Dino started work with TL2/Lukuru during early exploration in 2007. He is now the coordinator for Tshopo Province. At first he would spend 6 to 10 months in the field; but now he enjoys more time with his family while still maintaining a regular presence in the forest. His main regret is that he never had the opportunity of a university education. “It is too late now: I would graduate with completely white hair!” Nevertheless he is always continuing education on his own: English, mechanics, geography… He has six children and is encouraging all of them to continue at the University.